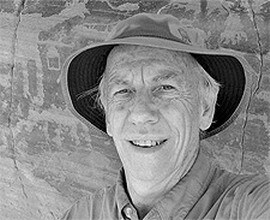 John Wimberley was born in Bermuda during 1945 and currently lives in southern Oregon. His first photographs were of flight operations on aircraft carriers upon which he served during the Viet Nam war. Following his discharge in 1967, John documented the Hippie culture in San Francisco. While photographing a group of trees in 1969, the first of a series of deeply transformative experiences occurred. Afterwards, John realized that although photography records the physical appearance of things, to be successful his photographs would need to convey much more. To better understand and facilitate the realization of this insight, he began long-term studies of religion, mysticism and psychology. Although completely self-taught, John’s first one-man show in 1973 prompted Artweek to write: "The first thing that one is made aware of is that the photographer, John Wimberley, is a craftsman of the highest order. His prints are not merely technically correct, but wonderfully alive." Unhappy with commercially available photographic chemistry, John performed years of research that resulted in two pyrogallol film developers that are still sold by The Photographer's Formulary. His work initiated the current renaissance of the use of pyrogallol, and he became a sought-after expert in black and white film development chemistry and techniques. Since then John has achieved world-wide recognition as one of contemporary photography’s finest technicians. He became a popular workshop teacher and lecturer. During the 1970’s and 1980’s John’s emphasis was on the landscape. He sought out places that conveyed spiritual power, returning for more than 25 years to certain locations. In 1981, he made a series of photographs of a woman underwater, which resulted in Descending Angel. Also, that year John published Presence, a limited edition portfolio of 12 prints. In 1983, John had the first of two, two-man exhibitions with Ansel Adams. Trips to New Zealand in 1985 and Ireland in 1986 added to his growing body of work. The second half of the 1990's found John photographing the old mining camps of Nevada. Then in 1999, his interest in shamanism led him to begin working with American Indian petroglyphs in the Great Basin, resulting in his acclaimed book Evidence of Magic, a monograph containing 62 photographs. Now, with more than 44 years in photography, John's critically acclaimed work has been honored with more than major 70 exhibitions and has been extensively published around the world. His work is represented in more than 500 public and private collections, including many major museums. As The Herald of Monterey, California wrote: "Wimberley's undisputed technical mastery of photographing and printing in black and white is but the springboard for visual poetry of spiritual realms. What remains unnoticed by most, as seen through Wimberley's eyes, becomes a powerful, mysterious invitation." All photographs are available as archivally processed, selenium toned gelatin/silver prints enlarged from original photographic negatives by John Wimberley. Prints are dry-mounted on 4-ply, acid- free mat board. They are window matted and signed in pencil on the front of the mat at the lower right corner of the print, and are supplied unframed. No digital manipulation is used at any stage of the process. For both technical and aesthetic reasons, not all images are available in all sizes. Actual print sizes will be slightly smaller than stated due to the proportions of the image and trimming of borders. Dimensions are in inches. Prints are made in editions of 100. When an edition has sold out, the price of the next edition is increased by 30%. Unless otherwise stated, prints are First Edition.